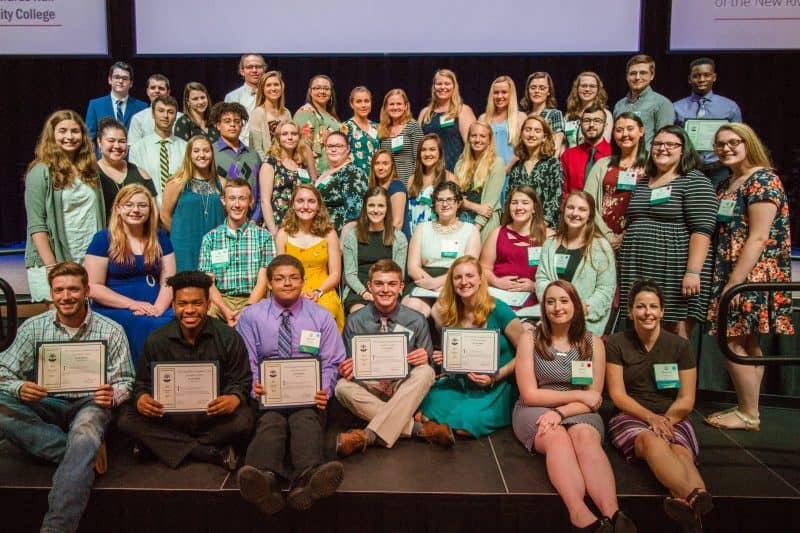 The Community Foundation of the New River Valley (CFNRV) recently held its 2018 scholarship awards dinner in Edwards Hall at New River Community College to celebrate $65,318 in scholarships to 58 students. The two hundred guests included scholarship recipients and their families, donors, principals, guidance counselors, and foundation volunteers. NRCC President and CFNRV board member Dr. Pat Huber led the program and introduced the speakers including Robert Graham, Superintendent of Radford City Public Schools; Jamous Bitrick, a scholarship recipient set to attend Radford University this fall after graduating from NRCC; and Tayler Lewis, a four-time CFNRV scholarship recipient attending Radford University. Each spoke to the value of higher education and the importance of community support. Mr. Graham, a Radford High School graduate, shared his desire to come back to the community that had once served him so well. Mr. Bitrick told the crowd of his experience in the workforce before starting college, and how it opened his eyes to the benefits of a degree. Ms. Lewis shared details of her unique research at Radford University and her opportunity to present that work in Canada later this summer. The CFNRV then recognized the 58 scholarship recipients. Of these, 26 are first generation college students. The recipients are set to attend Radford University, Virginia Tech, and NRCC; as well as colleges across the country including the University of Georgia and Savannah School of Art and Design. The number scholarships awarded from the CFNRV has grown steadily since the program began in 2002. From a single $500 scholarship awarded that year, the program has grown to award over $65,000 to dozens of students annually. The awards are made from 40 endowed scholarship funds created by individuals, families, and NRV businesses and managed by the CFNRV. In 2017, the CFNRV created an endowment to honor the scholarship program’s chief architect, Laura Pynn, who has been on the foundation staff since 2007. The fund awarded its first scholarship this year. “It’s satisfying to know that I’m helping him [Sage Church] on his journey,” Laura notes. More information about the CFNRV’s scholarship program can be found on our website. The 2019 scholarship application will open online in October 2018 with a deadline in early February 2019. Anyone interested in starting an endowed scholarship fund to support an NRV student may contact the foundation at 540-381-8999 or email jessicawirgau@cfnrv.org.